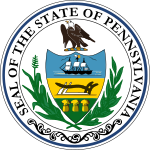 The 1788 United States Senate election in Pennsylvania, held on September 30, 1788, was the first United States Senate election held in Pennsylvania. The Pennsylvania General Assembly, consisting of the House of Representatives and the Senate, elected Pennsylvania's first two United States Senators, William Maclay and Robert Morris. Upon the expiration of Sen. Maclay's term in 1791, the State House of Representatives would not be able to elect a new United States Senator due to a dispute regarding the rules and procedures of the election. The seat was finally filled in a 1793 election. ^ a b c "U.S. Senate Election - 30 September 1788" (PDF). Wilkes University. Retrieved December 21, 2012.